I wish I could say I baked these myself, but my cupcakes are mostly the Duncan Hines or Betty Crocker variety. I came across these gorgeous Chanel-inspired cupcakes online. Love, love, love the intricate details. The interlocking C’s! Those kitten heels? Too divine. They are almost too beautiful to eat…but who am I kidding, I’d still gobble them up! 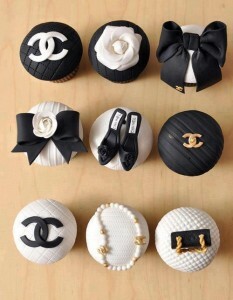 Since an actual Chanel bag is not in this mama’s budget right now, I’ll treat myself to some yummy Chanel cupcakes instead…and wish all WowMoms can treat themselves to a sweet Chanel treat too!